Slickplan is a web based sitemap/flowchart generator that allow you to create beautiful sitemaps and flowcharts design for free. It's specially designed for web designer and developer but anyone can use slickplan who needs a quick and professional sitemap or flowchart for their planning project. 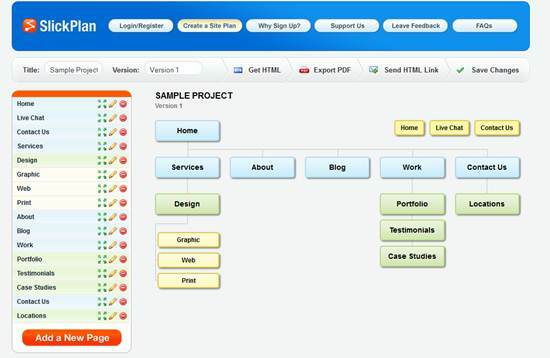 The Sitemap and flowcharts created by slickplan can easily send it directly to your clients via an HTML link or exported PDF. After generating sitemap or flowchart for your site it give you HTML code in unordered list so you can easily insert it into your page.